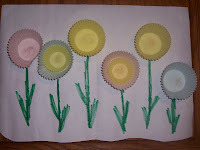 One of the teachers at our preschool does a great spring craft with cupcake papers. She makes a very cute display of a spring garden. The craft is very easy to make and it really looks adorable. You will need cupcake liners large and or small, a piece of paper, glue, and crayons or markers. The children put the glue on the paper where they would like flowers to be. Then they place cupcake liners on top of the glue. Sometimes you can put a small cupcake liner inside a larger one to create a more dramatic effect. After everything is glued on the children can take markers or crayons and decorate the picture. It really is quite cute. While I'm here, I did forget to mention that a good staple to have in your home for crafts is glue. I like glue sticks. Mostly because there is much less mess, and much less drying time.